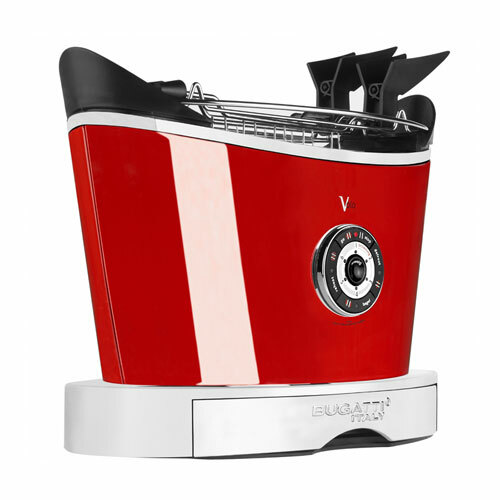 Combining a superb design with high-tech features, the BUGATTI toaster will bring a touch of Italian style to your kitchen. Featuring a motorised toast lifting system for easy toast removal, the Volo Toaster also has six electronic browning control options, wide slots to accommodate varying thickness of bread and comes complete with crumpet warming rack! Volo's many innovative features are integrated into the unique design of the toaster. The generously sized bun warmer easily accomodates thick slices including bagels and can also be used as a serving tray. The integrated tray in the base neatly catches crumbs.